The Kirklees Way is a 72 mile way marked footpath. It opened in 1990 and includes the Upper Colne Valley, Spen Valley and Holme Valley. 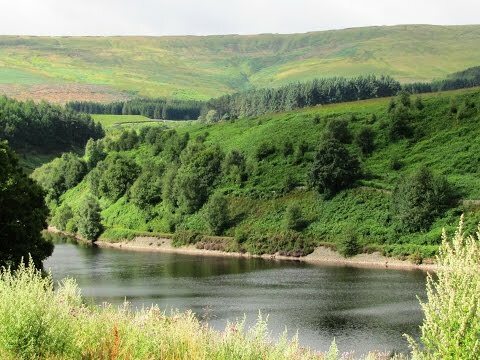 The Holme Valley Circular Walk is a 24 mile walk through the Holme Valley taking in a wide variety of scenery from quiet villages to rolling fields and wooded valleys. The walk starts from Berry Brow Railway Station near Huddersfield and heads south to Honley, Netherthong and Holmfirth. It then passes around a series of reservoirs surrounding Holmbridge then continues to Hade Edge, Hepworth and Thurstonland before returning to Berry Brow. There are many vantage points along the route providing beautiful panoramic views, including the historic Castle Hill an Iron Age Hill Fort. Hade Edge is a small village surrounded by stunning countryside and overlooks Boshaw Whams Reservoir. The Huddersfield Sailing Club is situated at the far side of the reservoir and they hold annual sailing competitions. The village houses a Junior and Infant School, a Pre-School, a Methodist Church, a butcher shop (The Big Sausage) who do fantastic award winning pies and a pub the Bay Horse. There was once a co-op and a fish and chip shop, both closed in the 1950, and a grocery store and post office which closed in 1989. Holme Styes Reservoir, frequently used in episodes of Last of the Summer Wine, is a very pretty little reservoir on the edge of the woods south of Holmfirth. There is a lovely walk up through the woods to Hades an old abandoned settlement. We park in Ramsden Reservoir car park and make our way to the picnic area and turn right uphill past a bench then bear right between two walls into some trees. We follow the wall on our right with a stream on our left. We soon cross the stream and when we come to a stile and a wall we do not cross but turn right on the Kirklees Way. We keep following the track uphill turning left at the sign post for Ramsden Road until we meet the road. We now turn right and follow the minor road for approx 1.75 miles until we come to a cross roads. We cross over the road and turn immediate left down a track. We head forwards downhill passing a farm and a building on our right then a little further on we turn right over the stile with a yellow marker. At the little road we turn right then left at the farm. We walk by the side of the farm following the footpath sign then head forwards to meet a road. We cross straight over and take the footpath to the left through the fields until we meet another road. We turn right slightly downhill then at the junction we turn left onto Upper House Road and head forwards. We are now at Strines Moor. After walking round the bend to the right we walk to the end of the houses and turn left at the footpath sign going uphill to a house. We keep heading forward until we meet the road. We turn left slightly downhill with Boshaw Whams Reservoir on our left to the t-junction then turn right past the Brindon Addy butcher shop (The Big Sausage) towards the Bay Horse pub. We turn left opposite the pub onto Bent Lane then straight forwards at the sign for Standbank Farm. We pass a seat and then walk through the middle of the farm following the footpath sign. We go through a gate, turn left and head forwards to the left of the wall going downhill to meet the road. We can see Holme Styes Reservoir down below on the right. At the road we turn right downhill then at the bend we turn left onto Clough Foot Lane and follow the track. The track splits into two we take the right fork down to Holme Styes Reservoir. At the gate we turn right to cross the bridge at the end of the reservoir. Immediately after the bridge we turn left, no sign post, uphill through the trees alongside Reynard Clough. At the top we turn right and head forwards to meet a track we bear left and keep following the track going over a stile next to a gate then straight over at the cross roads of tracks until we meet the road. We turn left then immediate right over a field downhill following the wall on our right. At the bottom we cross over a little stream and head uphill on the track to the left of the trees. We keep following the track through the fields going through a small gate at the side of a big gate and ignoring two paths on the right and one on the left and head downhill until we come to the stile and the wall at the start of our walk. We go over the stile and bear right retracing our steps back to Ramsden Reservoir. This is an easy walk using footpaths and tracks, some quite stony, on the Kirklees Way and Holm Valley Circular Walk. There are fields with gates and stiles, some minor road walking and some gradual gradients. Approx 7.5 miles allow 3 hours using OS Explorer Map OL1, The Peak District Dark Peak Area. Parking: Ramsden Reservoir free car park. There are no public toilets the nearest ones are at Holmfirth. For refreshments there is a butcher and a pub the Bay Horse at Hade Edge. There are ample shops, cafes, take-away, pubs and restaurants in Holmfirth. There is a picnic area at Ramsden Reservoir.